Sorry, I Still Haven't Made Dark Cloud 3. Despite Your Requests. Flowers bloom. Beaches fill with people. Leaves fall from trees. Suddenly, it is Christmas time and another year has passed—another year of me not making Dark Cloud 3. "Why would you ever even make Dark Cloud 3?" you might ask me, referring to a possible sequel to a terrific PlayStation 2 role-playing game from the Professor Layton people at Level 5. "I have no plans to make Dark Cloud 3," I'd respond, chortling, since, hey, isn't that what game companies always say when they just don't want to give a straight answer? Look, I don't make video games. I report about them. But ever since I interviewed the folks at Level 5 in October of 2009, I get e-mails from people who hope I will do it. I think they're getting their wires crossed. 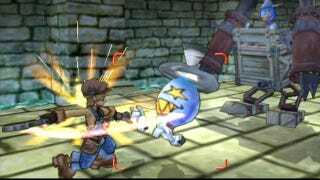 Back then, I asked the Level 5 folks if they were interested in making a sequel, and one of their producers said: "There are many staff members, including myself at Level 5, who have worked on the Dark Cloud series... There are some who decided to join Level 5 because they love the Dark Cloud series. So, if requests from users should increase in the future, we would seriously consider making it." Somehow that turned into people e-mailing me about making one, which is a tactic that's about as effective as asking Hideo Kojima to stop making Metal Gears. In March 2010, I highlighted several of the requests I had received to make the game. I headlined the piece; "Nine People Want Me To Make Dark Cloud 3". Naturally, I got a bunch of joke requests after that. Things settled down in 2011. I also think you should make a dark cloud 3. Make it. Surpass Diablo 3. Make Dark Cloud 4. Subject line: PLEASE MAKE DARK CLOUD 3!!!! That's a moving request. Really, the problem is I just don't know how to code. So it ain't happening. Sorry.